Bala is a gorgeous town with phenomenal scenery and a strong history to match. It is situated within the Snowdonia National Park, with mountains reaching close to 3000 ft., deep valleys, magical waterfalls and many other gifts from nature. Visitors to Snowdonia often choose Bala as a base, thanks to its idyllic atmosphere and proximity of places to go, things to see and activities. Pale Wood Holiday Home Park sits upon the edge of Snowdonia National Park and is just 4.5 miles from Bala, making it ideally placed to enjoy a tour of such incredible natural beauty. Here are 5 of the best places to visit when staying with us at Pale Wood Holiday Park. Run from the Bala Lake, this is an organised and instructed adventure activity centre that offers a plethora of different activities. From canoeing, kayaking, climbing, abseiling, windsurfing, sailing, archery, camp, raft build, mountain biking, powerboating, hill walking, gorge walking and white water rafting. Bala Lake is the largest lake in the whole of Wales, of which lots of water based activities, can take place. 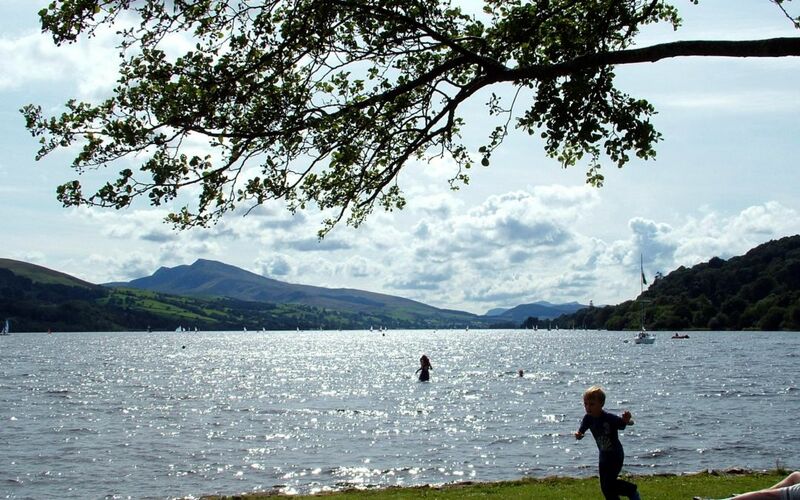 Its natural beauty has been acclaimed by writers, explorers and travellers alike, praising Bala Lake to be one of the most wonderful places on earth. Whether you’re after an exhilarating watersport activity or just fancy a ramble around the lake, it is very much worth a visit! Pale Wood Holiday Park is proud to home its very own coarse fishing lake. The lake is kept well stocked making it an excellent place to visit for those that enjoy a calm fishing activity in a peaceful environment. Those that would like to enjoy a spot of fishing on a sunny day by a lovely lake, Pale Fishing lake is the place to be. The Bala lake railway is a gorgeous steam railway that can offer a delightful 9 mile return journey alongside Bala Lake, through the beautiful Snowdonia National Park. The narrow gauge steam railway promises extensive views of the lake, countryside as well as several mountains, such as Arenig Fawr, Aran Benllyn and Aran Fawddwy mountains. Mountain Biking at Antur Stiniog? A not for profit enterprise that has established to provide world class mountain biking facilities and environment for the people and visitors of North Wales. The bookable ‘uplift’ allows visitors to enjoy downhill biking and freeride trails. There are up to 20 uplifts per days so if you want to enjoy multiple runs try and get there earlier, or pre-book a full day!